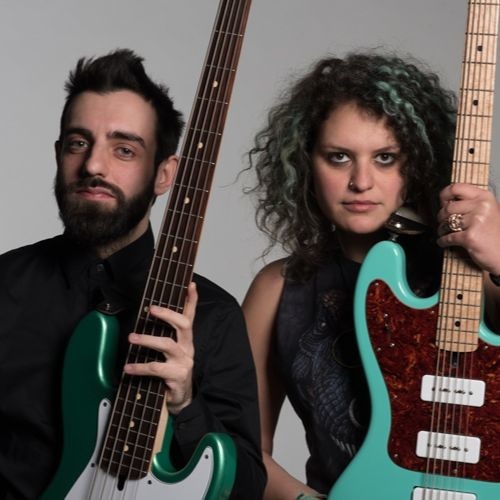 Having met through the Three of a Perfect Pair Music Camp in 2011, bassists Julie Slick and Marco Machera started collaborating in April 2014 to play a short run of shows in Tuscany, after Julie's European tour with The Crimson ProjeKCt. Very spontaneously, some brand-new songs were written during a couple of days rehearsals and played to very appreciative Italian audiences. The impromptu ‘bass duets’ ended up being so satisfying and well-received that Julie and Marco eventually decided to write more material together and record an album. Nearly one month later, “Fourth Dementia” was completed. It's not quite what one would expect from a couple of traditionally low end instruments; the recording reinvents the role of solo electric bass and brilliantly displays the songwriting abilities of the duo; it's a captivating combination of loop music, ambient soundscapes and interlocking bass patterns, always melodic yet aggressive and edgy at times. The bass guitar has a prominent role throughout the record, however more tracking was provided by acclaimed drummers Eric Slick and Pat Mastelotto, and violinist extraordinaire Sarah Anderson. "Fourth Dementia" was promoted with a short tour of the east coast of the USA in January 2015, with concerts in Washington DC, Baltimore, New Jersey, Philadelphia and New York City. Julie and Marco were joined on stage by special guests Pat Mastelotto on drums (King Crimson, Mr. Mister, XTC, David Sylvian) and Philadelphia-based guitarist Tim Motzer (Ursula Rocker, David Sylvian, Secret Rhythms). At the same time, the duo completed the recording and production of their second effort, "Le Fil Rouge", also with the help of their fan base, contributing to a fundraiser on Kickstarter. Machera says: "I feel this record marks a real leap forward for us. I still love Fourth Dementia and its spontaneity, but I'd say that Le Fil Rouge sounds a lot more organic, diverse and sophisticated." The album undoubtedly adds more layers to the sound palette of the duo: most of the songs were built around heavier riffs, with a strong emphasis on groove and occasional hints at dub bass lines, jungle and trip hop rhythms. "We also wanted to have more vocals this time", says Machera, who sings on "Mirror Writing" and "Die in Dust".